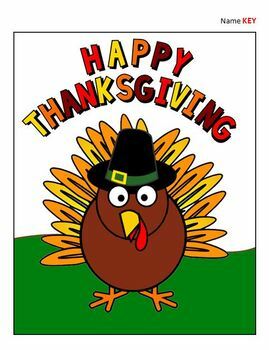 Why should these fun coloring activities stop once kids enter 4th grade? 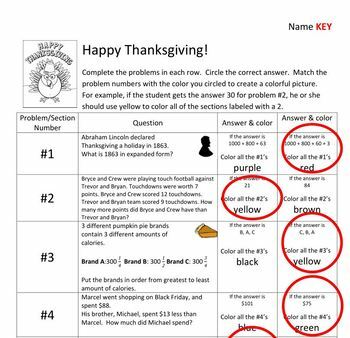 Watch your students actually care about their answers as they quietly work to color each picture correctly. You can assess their progress quickly, just by glancing to see if they colored their pictures correctly. This is the 4th grade version, aligned to 4th grade Common Core standards. If you would like a 5th grade or 6th grade version, please please check them out too! The directions for students are as follows: Complete the problems in each row. Circle the correct answer. 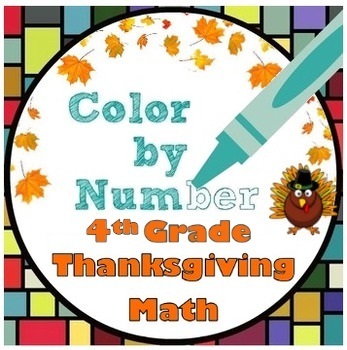 Match the problem numbers with the color you circled to create a colorful picture. For example, if the student gets the answer 21 for problem #2, then he or she should use yellow to color all of the sections labeled with a #2. If the answer is 84, then he or she should use brown to color the sections labeled with a #2. 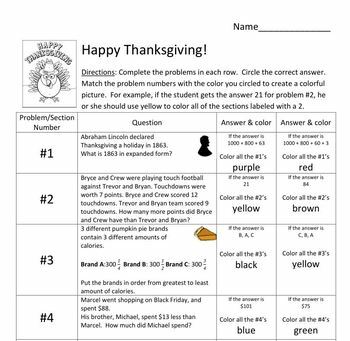 You can also grab this item as part of a fun bundle of 6 Thanksgiving Math activities, a Thanksgiving Pilgrim Coordinate Picture, and even more over at my shop!